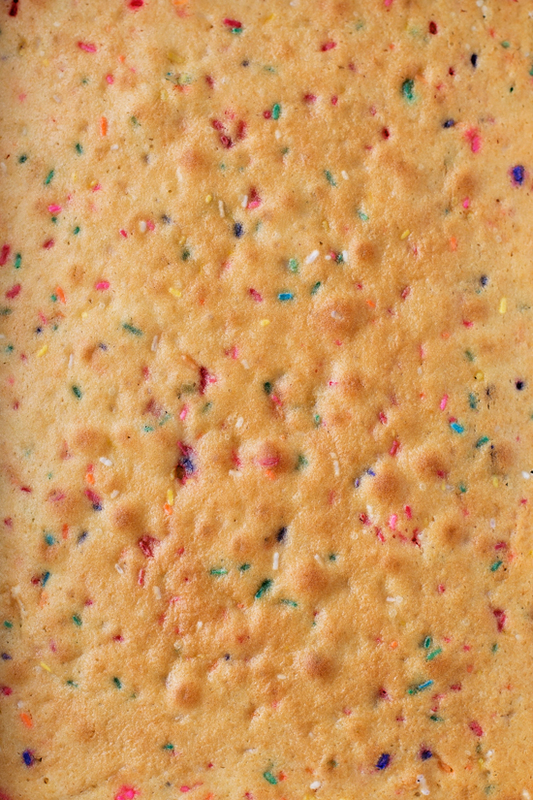 It’t time to celebrate with this ultra fluffy homemade funfetti cake! It’s bursting with sprinkles and topped with a fluffy vanilla buttercream. Bring on the birthdays!! ???????? Ever since I was little I can remember always requesting a funfetti cake for my birthday. It was & still is one of my favorites! It’s been a few years since I’ve had it, so this time I decided it was time to make a homemade version- 100% from scratch. And guess what? It’s even better than the boxed kind! Making cake from scratch can sometimes be intimidating, but throw it into a 9×13-inch pan and somehow it’s a breeze. Am I right? Seriously though, you’ve totally got this! 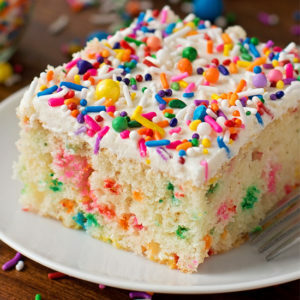 You’ll need a handful of sprinkles, nothing fancy, just colorful jimmies, along with cake flour, and high quality vanilla extract. Grab a large mixing bowl and a hand mixer (or a stand mixer) and you’re set! For the base, you’ll want to start by beating the sugar, butter, vanilla extract and almond until they’re light and fluffy. Then add the eggs and egg white, and mix until combined. In a small mixing bowl sift the all-purpose flour, cake flour, baking soda, baking powder and salt. With mixing speed on low, gradually alternate adding the dry ingredients along with the buttermilk. Mix just until combined, then fold a half cup of sprinkles by hand. Pour into a lightly greased baking pan and bake for 25-30 minutes or until golden brown on top. While the cake is cooling whip up the frosting. It’s really quick, easy and sooo fluffy!! Start by creaming the butter, then add the vanilla extract, salt and powdered sugar. Mix until large crumbs form, then add the heavy cream and beat until light and extremely fluffy, about 2 minutes. Spread it on top of the cooled cake and garnish with lots of sprinkles. If you’ve got extra special sprinkles, now would be the time to use them! I absolutely adore Sweetapolita’s sprinkle mixes, aren’t they gorgeous? ???? They’re so bright and cheery, perfect for a celebration. Cut and serve big ole slices of this cake and watch it disappear in seconds. There will be smiles all around. This cake is definitely going to become a tradition in our family. It’s buttery, sweet and bursting with color. Kids will definitely love it, and adults will too! ???? 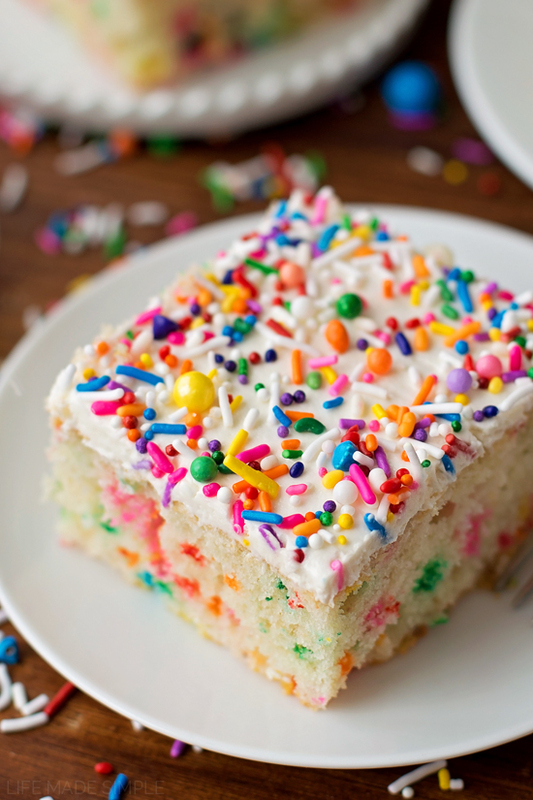 It't time to celebrate with this ultra fluffy homemade funfetti cake! 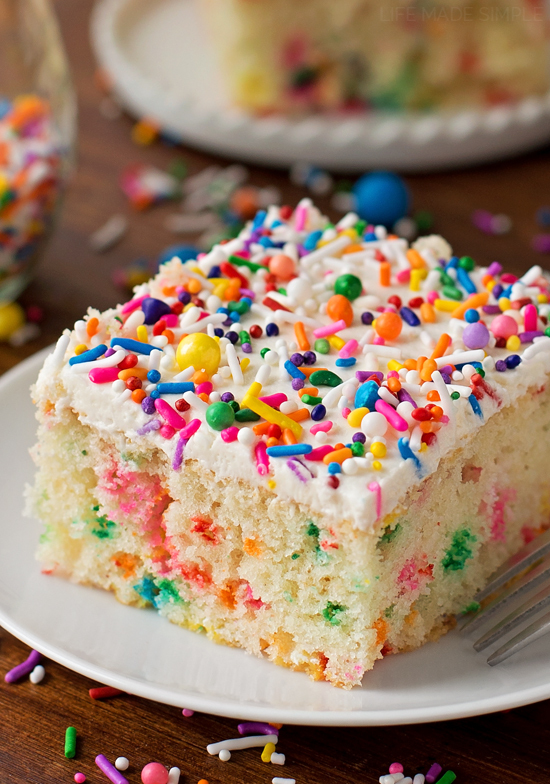 It's bursting with sprinkles and topped with a fluffy vanilla buttercream. Bring on the birthdays!! Preheat oven to 350 degrees. Lightly butter and flour (or spray) a 9x13-inch pan. Using a handheld or stand mixer fitted with a paddle attachment, beat the butter, sugar and extracts light and creamy, about 3-4 minutes. 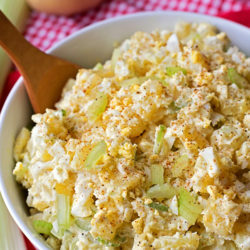 With mixing speed on low, add the eggs and egg white, beating after each addition. In a medium mixing bowl, sift together the flours, baking powder, baking soda, and salt. With mixing speed on low, alternate adding the dry ingredients with the buttermilk, taking care not to overmix. Using a rubber spatula, fold the sprinkles. Pour the batter into the prepared cake pan, spreading into an even, smooth layer. Place in the oven and bake for 25-30 minutes or until the cake is golden brown on top and a cake tester inserted into the center comes out clean. Remove from the oven and allow to cool before frosting. To prepare the frosting, in a large bowl using a hand-held mixer or stand mixer fitted with a whisk attachment, beat the butter until light and creamy, about 2 minutes. Add the vanilla, salt and powdered sugar, mix until large crumbs form, then slowly pour in the heavy cream. Gradually turn speed up to medium-high and beat for 2-3 minutes or until fluffy. Scoop the frosting into the center of the cake, then using a offset spatula, spread over the cake into an even layer. Garnish with sprinkles if desired. Cut and serve, enjoy for up to 3 days at room temperature. 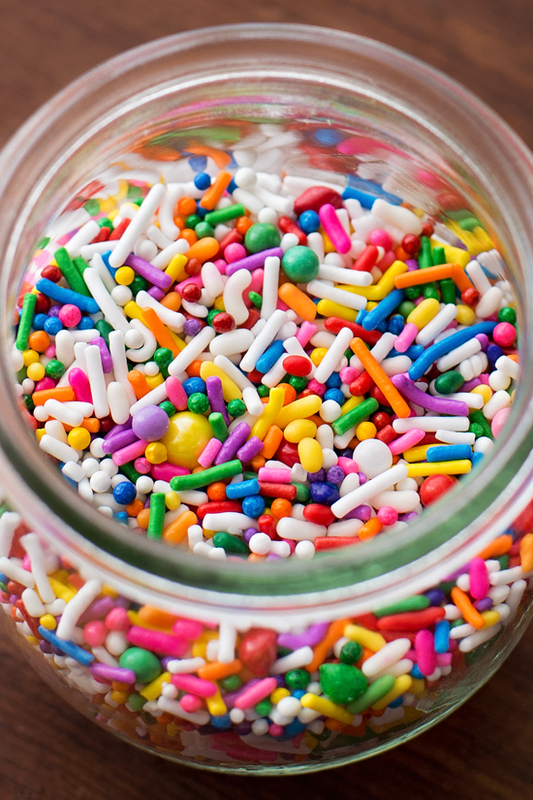 -Try switching things up by using holiday specific colored sprinkles for any occasion! 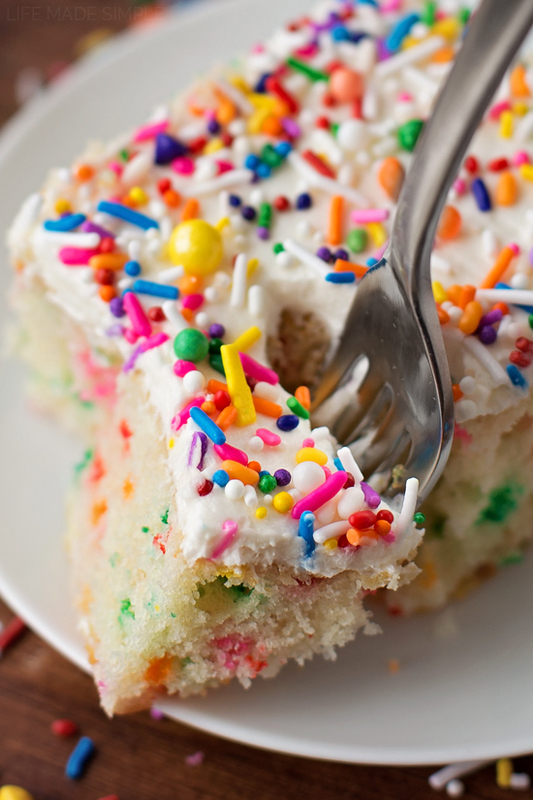 I love a good homemade funfetti cake. Even better that this is a sheet cake. There’s just something about sheet cake that I love. Hi, Thank you for sharing such a great recipe. I have tried it and it came out beautifully except the texture was slightly dense not as fluffy as yours. Where did I go wrong ? Appreciate your advice on this. It could be due to a few things, like not creaming your butter and sugar enough, using too much flour, over-mixing the batter or over-baking the cake. Hopefully next time it’ll be perfect! Fabulous! My new go to homemade funfetti cake recipe! Thanks Hannah! So happy to hear that! I need to make a large funfetti cake for a baby shower. Can this recipe be doubled? Definitely, although what size pans do you plan on using? Hope it was a huge hit! Did the two 10″ rounds work out? I am making this for a bridal shower (my daughter has loved funfetti cake since she was a little tyke!) and I’d like to make a layer cake. Can I make this into cupcakes? Loved it thank you for this recipe I did it with my 2 1/2 year old daughter and she had lots of fun making it. Nothing like home made:-) yum! So sweet! Thanks for sharing Maribel! I made this for my husband’s birthday and he said it was his all time favorite cake ever. It was delicious and beautiful! Thanks for sharing Jennifer! Hope your husband had a happy birthday! I’m allergic to nuts but I would love to try this recipe. If I don’t use the almond extract will it affect the cake much? Could I make this with vegan butter? How long does it need to bake using (2) 8in or 9in rounds? Hi Anna! I’d check them around 18 minutes and then go from there. Hi I wanna use two 9″ square pans. Would I have to double the recipe or would one batch be enough? I noticed you said you like using Sweetapolita’s sprinkles. Every time I make a confetti cake, I find it tastes off a bit, and I believe it’s the jimmies. 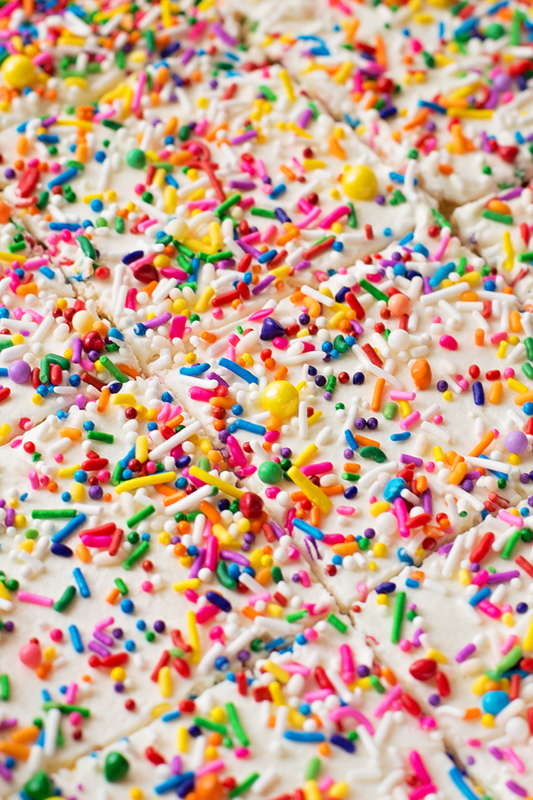 Is it possible that some of these store bought sprinkles could give the cake an off taste? Just curious…thanks! I started buying “higher quality” sprinkles a few years ago, and there is a noticeable difference in taste. Great question btw!! Hi! I’m just wondering if this cake is ok to be stacked? Or is it too delicate to make a 2 tiered cake!? Thank you. It would be great for a layer cake! Hi Joyce, I used jimmies only for the batter (like these), and then one of her sprinkle mixes (with all of the fun sprinkles in it) for the top. Recipe call for one egg white, just pour the egg white to the mixing ? Doesn’t have to beat it until peaks form? Hi Ana, you can just add it with the rest of the eggs, it doesn’t need to beaten separately. Hi I just baked this recipe and it didn’t turn out well. I don’t know what the fudge happened but the cake never set and I had the cake in far too long for what it was stated. My cake was too yellow and I added the egg white. The sprinkles disintergrated inside the cake and it didn’t create the polka dot effect. I’ve followed everything the recipe said and used the right ingredients. So dissapointed. I’m sorry to hear that… something definitely went wrong! We make this cake often and it always turns out (have you watched the video tutorial here?) Did you add the leaveners? And use real buttermilk? As far as the sprinkles go, you have to use jimmies, any other sprinkle will streak once it’s in the batter. Hope that helps! Hi – I’m keen to bake this cake for my daughter’s birthday party this weekend but I am a little flummoxed by the two different flours in the recipe. Here in New Zealand we have ‘standard’ flour which is like an all-purpose flour and I have read online that our standard flour is cake flour, and also that it is the same as the American all-purpose flour. So my question is – will I be ok to use just 2 cups of (NZ standard) flour? Thanks for any advice! Thanks for the reply. I used another similar recipe which only specified all purpose flour so I used our standard flour and it turned out wonderfully! Would this recipe work in a bundt pan? How long should I bake it? Hi Katie! I don’t see why not. Just make sure to butter/flour (or spray) your pan really well. I’d use a 10-cup or 12-cup pan. As far as the baking time goes, I’m not 100% sure since I haven’t tried it in a bundt pan before, but I’d guess you’d need to give it a little longer. Check it at the 30 minute mark, then again every 10 minutes after that to see if it’s done (I’m thinking about 45 minutes should do). Hope that helps! Thank you for this recipe! It was delicious and moist! I doubled the recipe and made it into a triple 9 inch layer cake which set up beautifully. The cake was the hit of the party. I will be making it again for my niece’s wedding reception next June. Thank you again. 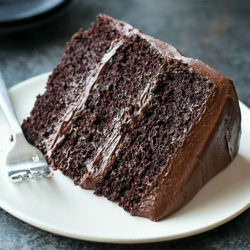 I’m looking to make a 2 tier cake. With an 8×13 and a 6×13. Will I need to double this recipe?? Yes, definitely double it. You may have a little leftover. I made this cake for a birthday and it did not turn out well. The cake was very thick & not sweet at all when finished and the next day was a brick. The only thing delicious about the cake was the frosting I made , which came from a different website. I followed the directions precisely , so maybe there is something I was suppose to do that isn’t specified. I’m glad it turned out for other users, this was a total fail for me… maybe too much flour in this recipe?? Do I need to change anything to bake this at high elevation? Hi Natalie. I’m planning on making this cake on a Friday afternoon to be served at a brunch on Saturday morning. Would you recommend putting the frosted cake in the fridge? Any issues with the decor sprinkles on top spreading color in the fridge? Thanks! I made an 8 layer cake (4 x10” & 4 x8”) for my baby girls 5th birthday party this weekend! I was worried that it would be too heavy & would somehow lose the moistness. Wellll, I’m happy to report that although it was leaning a little bit, it was still delicious & very moist! We had a house full of 60 people & there wasn’t a single piece of cake left! 🙂 Great recipe!! Made this today but my icing is really runny how can I fix this before I put it on my cake. Hi Ashley! You can add more powdered sugar if you need to or toss it in the fridge for 30 minutes to see if it firms up. It definitely shouldn’t be runny. Perhaps your butter was too soft or you added too much cream? My boyfriend bought me a Kitchenaid mixer for Christmas after many many not so subtle “I love to bake” hints. After exhausting cookie recipes, I asked him what his favorite kind of cake was. Naturally a grown man would request fun fetti! I made this cake earlier in the week and was super impressed with how it turned out. Since neither of us need an entire cake, I brought some of it to work and even the harshest critics said they loved the consistency (almost like a pound cake) and they didn’t find it waxy from the jimmies (I used Betty Crocker ones I found at my local grocery store). The icing was also delicious. Since I have so many ingredients left over (they don’t sell buttermilk or heavy whipping cream in reasonable sizes), I am baking again today. This time as cupcakes rather than a cake. I just pulled a batch out of the oven and they take between 20-30 minutes in the oven (I kept a really close eye on them – waiting for that golden brown color and using a skewer to test the middles). 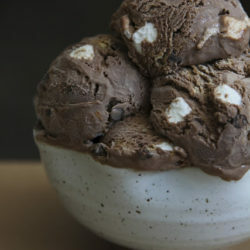 Overall, I could not be more pleased and will be referencing this recipe for years to come. About how many cupcakes did this batter make? I’m not sure if it would fit into a 9×13-inch pan without it going over. But I haven’t tried! This cake fell flat for me, literally. It was well cooked but too thin to be a good 9″ 2 layer cake. Being so thin, it was dry straight out of the oven. I ended up baking a different cake but decorating it like this one. It was beautiful. Excited to try your recipe TODAY . It would be wonderful if you could help me understand what salt you are using. Kosher Sea Salt is hard to find. In my research, I’ve just discovered that Morton’s salt tastes much saltier than Diamond. Kosher refers to rough and course. There is sea salt and there is kosher salt but not finding both. Am I looking for sea salt that is course? Are you using Morton’s or Diamond? Appartently, there is a big difference!! I am eager to learn and get the correct brand and type of salt. Never thought my search on the internet would result in such a big learning expearience about salt!!! Seems there is a lot to be said about what brand and type of salt to use. It can make or break your recipe! I used Morton’s Coarse Kosher Sea Salt (link). Thanks for a great recipe idea, Natalie! I was wondering which Sweetapolita sprinkle medley you used – if you can remember? This was a great recipe! Cake turned out delicious despite me using the wrong type of confetti which ended up dissolving in the cake. It took a while to set but it did eventually, think I would start on a lower heat next time. But recipe is fantastic, lovely cake tastes like something out of a good bakery!